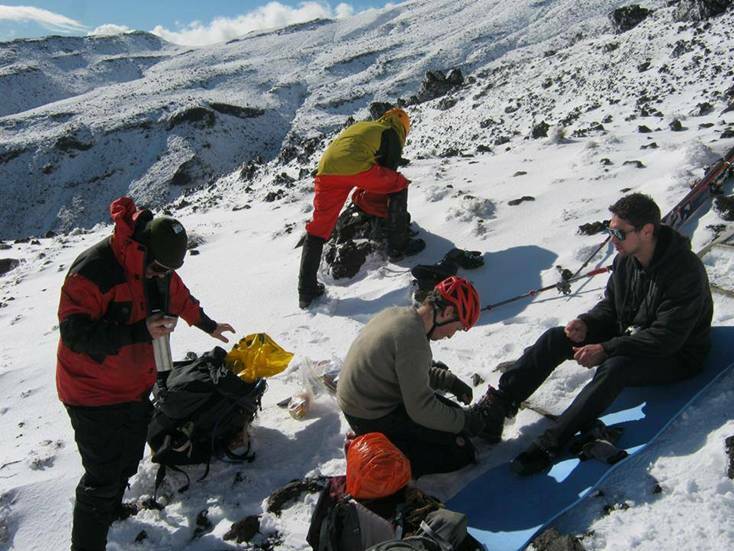 This is the tale of the tourist who was found on the Tongariro Alpine Crossing a week or so ago, trying to walk out in bare feet having lost his jandals in the snow (yes, you did read that right!). Of even greater concern was that the same guiding parties turned back four other similarly ill-equipped (at least they had shoes) walkers after this. This is the story as posted. This guy missed out on his Darwin Award this weekend…… by an ultra slim margin. When we found him he was on his way down, trying to get to his car in bare feet (He had made it to the top and fallen down Red Crater I think) and having fallen his hands were well cut up. His brain had switched to survival mode and he was focused on walking the last 5+ km of snow, ice and sharp volcanic rock to his car. NOTE TO REMEMBER – His brain was so focused on survival, survival instinct kicked in, that I had to insist he stopped and let us help him. He was initially refusing help. Stopped him, gave him warm chocolate drink, bandaged his hands, put socks on feet and hands and then another Kiwi party came down (also dragging down with them two more terrified, bleeding, Frenchmen who at least had sneakers on, not much use). A member of this other Kiwi group had a spare set of boots and agreed to take our guy down as well so that I could carry on. Had to put the boots on him, he could not do it for himself. Had to fix his hands, he could not do it for himself. We then started up again and found two more idiots coming up behind us, also in jeans, sneakers etc. We turned them around too, they were Polish. It is quite scary that people are still regularly ignoring or not even seeking the advice available from I-Sites and DOC Visitor Centres, and that there remains a strong perception that the mountains are safe and benign environments. Many of them only here what they want to hear and so the slightest hint that a walk may be walkable is all they need to start off. Even after being warned about winter conditions on the Crossing, a number still try to bluff their way through although many are stymied when shown a picture and asked to point to the crampons.